How can audio-visual collections be mobilized for the common good? How can (future) preservationists, curators and programmers be trained to achieve this goal? In May 2018, the EYE International Conference will explore answers to these and other questions, in a programme entitled Activating the Archive. 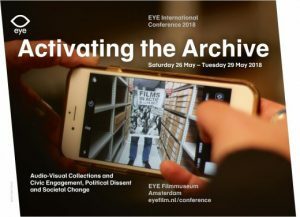 Audio-Visual Collections and Civic Engagement, Political Dissent and Societal Change.